Hello lovely blog hoppers! 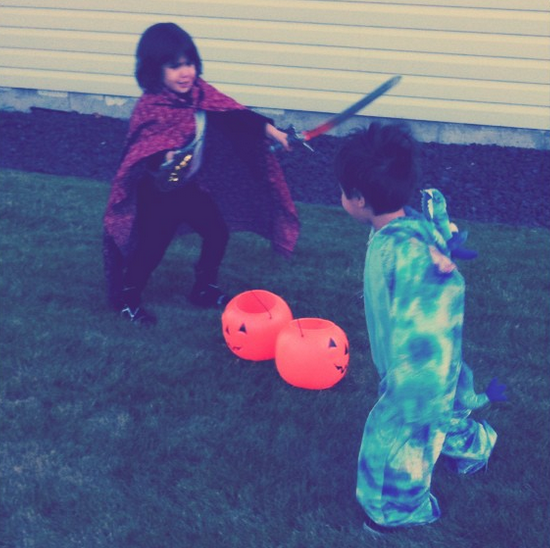 Once again, I’m posting as part of the Holidays with Jane: Trick or Sweet blog hop…this time about Halloween…which is kind of a broad topic, so I’m going to use it as an excuse to post cute pictures of my kids, okay? Okay! You can check out all the blog posts by my fellow authors here. 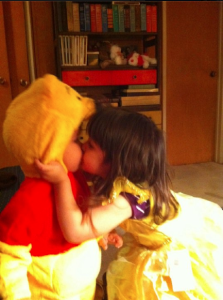 As soon as my kids were old enough to pick their own costumes (like 2 and 3), I let them. 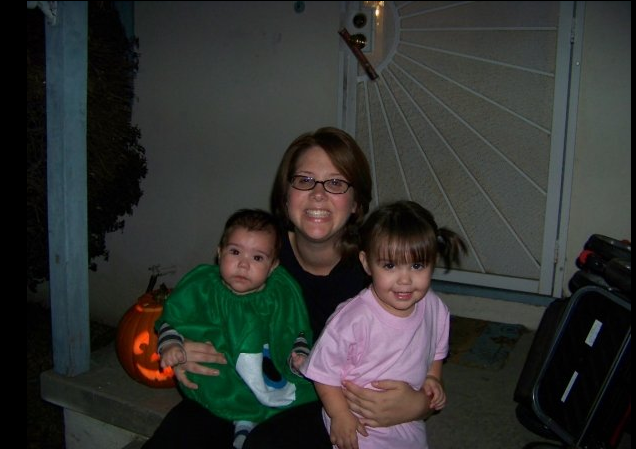 Here is the last year I picked the costumes…James is only 4 months old here! I call this “the year of the Rapunzel wig of doom.” There’s a lot of yarn in that wig. 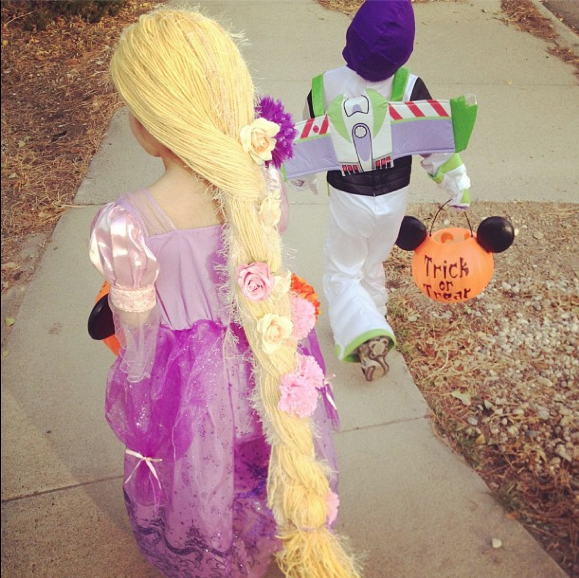 I think James has the Buzz Lightyear strut down, though. 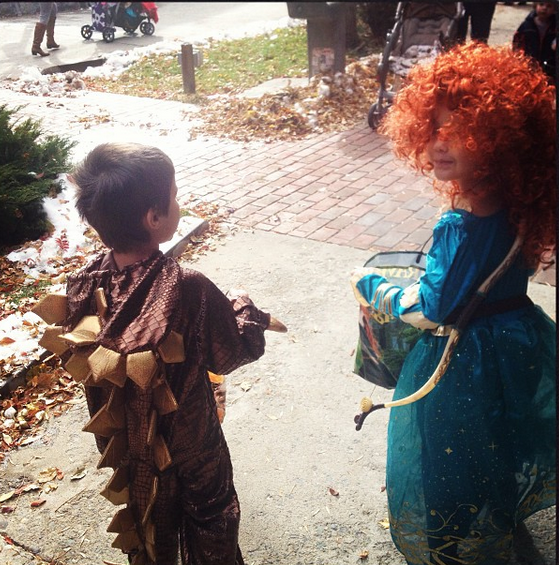 Maddie continued her Disney Princess / insanely good hair theme the next year. James was a bit into dinosaurs. 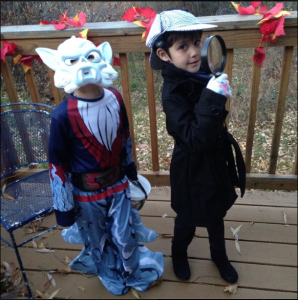 And last year, Maddie knocked it out of the park as Sherlock and James proclaimed his Skylander obsession as Night Fist. This year we are super excited to have a Vader and a “Killer” Kitty on tap for Halloween. What are your costume plans? Hello Holidays with Jane Blog Hoppers! Welcome to my little corner of the internet. Admittedly, my little corner is usually quiet and empty because I am the world’s worst blogger. However, I am super excited to be participating with my fellow authors in the blog hop to celebrate the release of Holidays with Jane: Trick or Sweet. 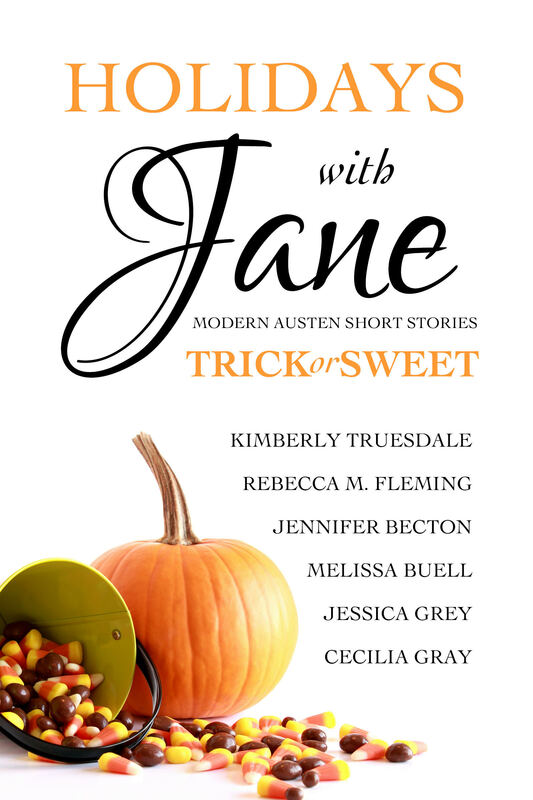 Halloween is the perfect time for a little magic, and several authors (myself included) have magical twists to their adaptations of Austen’s novels in this collection. In fact, this was Kimberly Truesdale’s first time writing magic (! ), and she knocked it out of the park in her Persuasion adaptation, Must be Magic. To Jess, especially, who can’t help but write magic and made me think I could do it too. Halloween just cries out for magic. And I’ve got a thing for teenage fairy godmothers, so I made the hero’s sister believe she was his fairy godmother (that’s my clue for the blog hop if you’re playing along, by the way: fairy godmother). The fun thing about this story is really the question of if there is really magic at work. I actually don’t think it matters: I think what matters is what the character’s believe about it. And as I was writing this story, I came to a realization. Magic doesn’t solve all the story’s problems. In fact. it seems more to create problems than solve them. That’s part of why I’m drawn to writing it – the additional layer of complexity, the character needing to figure out who they are apart from the magic – the ability to look at the “real world” through a “magical” what-if lens. But the funny thing about reality, is it’s still real even with magic. What we hope for and what we get are so vastly different at times that it FEELS like we’re being let down and IF ONLY magic were around to fix things: i.e. money trees, fairy godmothers, and love potions, life would be so much better. But what’s interesting about using magic in a story is seeing how characters have to overcome the situation without the use of it, and sometimes even in spite of it. So what say you? Are you a fan of magic in stories and what kind do you prefer? Make sure to check out the rest of the blog hop. You can see the full listing of posts here.